Like every family, we've got our standard Christmas albums that begin rotation around this time of year. Admittedly I put it off at least until the middle of December but if I don't get Christmas music going by then I wind up in a distinctly Grinchy mood by the time the big day rolls around. As I pointed out a few years ago, our rotation leans heavily on Ella Fitzgerald, the Rat Pack, New Orleans, and Bing Crosby. Never discounting our possible all time favorite, Ringo Starr. Every year we pick up a new Christmas cd and this weekend we picked a winner that is already livening our house. Last year I had discovered Gordon Vernick's Jazz Insights on iTunes. 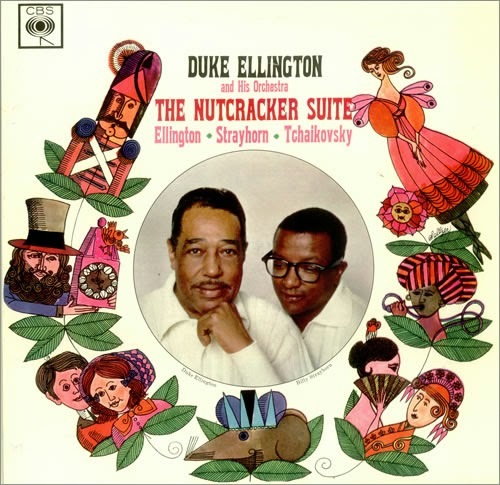 Poking through past episodes I was intrigued to hear his two-part special on Duke Ellington and Billy Strayhorn's take on the Nutcracker Suite. Swingin' ain't the word for it. The Nutcracker Suite is some of Tom's favorite Christmas music and he also loves the Duke so I don't know why it took me this long to remember to look for it. It is simply terrific. I don't know how they did it but this solid jazz take keeps the original classic front and center while still managing to be unique in its own right.